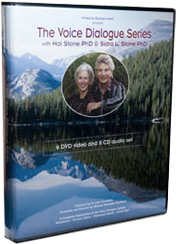 12 Videos — This is the only complete presentation by Hal and Sidra Stone of their work on Voice Dialogue, the Psychology of Selves, and the Aware Ego Process available on video. The videos in this series were created over a span of several years. The initial videos are a series of interviews conducted by Michael Rowland at the Stones’ home in Albion. In these, they discuss their work and their view of the significance of a psycho-spiritual approach to consciousness. These interviews are interspersed with the live recording of a workshop Hal and Sidra presented in the Blue Mountains of Australia (produced by Michael Rowland) several years later. The video sections from this workshop add another dimension to the presentation of the theory and implications of this psycho-spiritual approach to consciousness and the human psyche. The videos also include demonstrations of the Voice Dialogue method by Hal and Sidra in which they use each other as subjects. They teach from these demonstration sessions; discussing the facilitations and the significance of what the viewer can observe. 8 Audios — The audio CDs included in this set were recorded in the Blue Mountains at the time of the workshop. They are different from the CDs available elsewhere on this website and the material included is different from that on the videos. Michael Rowland, as interviewer, brings a different perspective to the Stones' work as he examines the role that opposites play in the drama of the selves that make up the psyche, the largely unrecognized role of energetics in relationship, and the importance of the spiritual component in this "psycho-spiritual" process. There is a section devoted to "illness as teacher" that examines the use of illness as a doorway to growth. Lastly, there is an excellent section on dreams to which Hal brings the knowledge he acquired many years ago during his training as a Jungian analyst.